Our operations began in the summer of 2000, with Eco Adventures offering outdoor recreational activities for children and adults. Eco Adventures was born out of our owners’ fascination with the natural environment, Barbados’ heritage, and a desire to share these Barbadian, treasures. It’s amazing how this island was formed, and how Barbadians lived long ago, and why there are many scores of Barbadian centenarians. Our first tours were hikes for summer campers, a service which continues to the present, and has expanded to youth groups, faith groups, the corporate sector, as well as guests to our island. Principal Guides: Victor Cooke received his training from the Late Dr. Colin Hudson, Environmentalist and Agricultural Scientist. 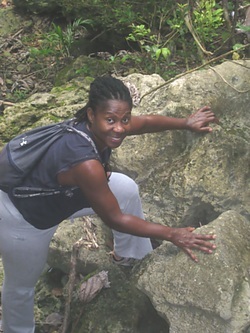 Dr. Hudson led the popular Hike Barbados Sunday hikes for seventeen years, and was a recognized wealth of knowledge on Barbados, especially local flora and fauna. Training was also received from Peggy McGeary, Education Officer, Barbados Museum & Historical Society, a fountain of knowledge on Cultural Heritage. Victor is ably assisted by his wife Melva, “The Essence of Naturalness” who is a trained and experienced personal care specialist, a naturalists and our resident photographer. Victor is a certified Hike Leader, having earned certification from Hike Ontario, Canada and a WFTGA certified tour guide trainer. He has also been awarded for Service Excellence in 2003, 2004, 2005 and 2006 by the Princess Cruises Line, and is a volunteer hike guide for Hike Barbados, the popular Barbados National Trust Sunday 3:30pm hikes.In 2009 Victor was awarded the Barbados Tourism Award for Service Excellence, Attractions & Activities. Book your next adventure today, don’t delay, it’s a great stress reliever for reasonable pay, learn about our little isle as you walk along the way, or by bus it’s very comfy. Fish for your meal today, we’ll make it fun like child’s play. We serve up Barbados in an entertainingly informative way, scores of locals and visitors, had that to say. fortunate to be able to hike through part of this beautiful island with Mr.
questions for us via email now that we are back home. We enjoy our recreational tours, because we really like what we do. Come and experience this joy with us.